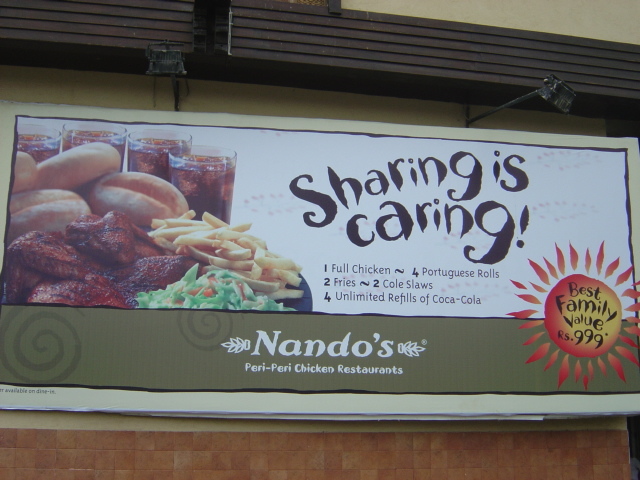 Nandos new ‘Sharing is Caring’ deal supposed to have the ‘best family value’ is essentially a publicity stunt to hook more people on to its flagship product – peri peri chicken. Not a bad idea in itself. Both KFC and Pizza Hut have captured a huge chunk of the Pakistani market using precisely these tactics. Whether it’s going to hit off with the consumer is too early to say, but this much is certain- it cannot compete with the likes of Espetada Rustica. There are many reasons for that, the biggest being there’s no story wrapped around this brand like it was in Espetada Rustica. There’s no talk of Christopher Columbus having an affinity for this exotic dish while on his daring adventures, no unique presentation of the dish like the strange hook-style skewer, even the ad is pretty straight forward devoid of any humor or even the Portuguese accent like in the previous ad. Then there’s the pricing. At Rs.1160 (Rs.999 +GST), the deal’s a bit on the expensive side. But that’s not the problem. The problem is that the creators of the deal have indicated that the deal is four people but when you actually see the deal, it’s sufficient for only three adults. Let’s say that the family Nando’s is talking about comprising of a couple and their two children. Even then it won’t be enough for this small family. They’ll just have to order something else or go elsewhere. What exactly does the deal comprise of? 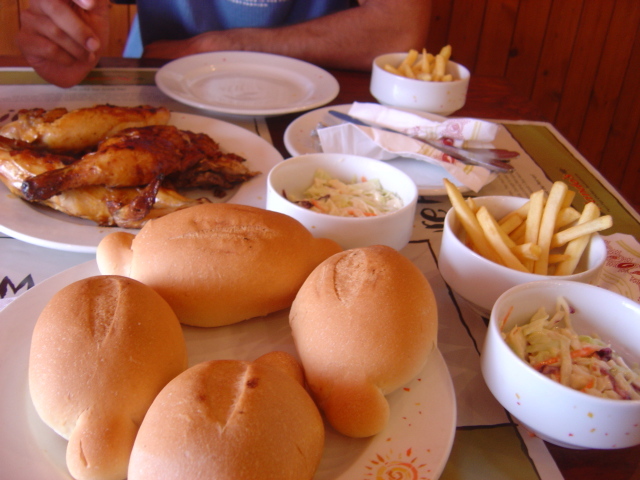 A ‘full’ chicken, four Portuguese buns, four sidelines (either fries or coleslaw only) and four drinks. The biggest misleading word is ‘full’ here. When you see the price coupled with this word ‘full’, the image that would conjure up in any consumer’s mind would be a succulently fat chicken enough to satiate the appetite of four people. But when the ‘full’ chicken is actually placed in front of you, you wonder whether the chicken was imported from the impoverished lands of Africa. 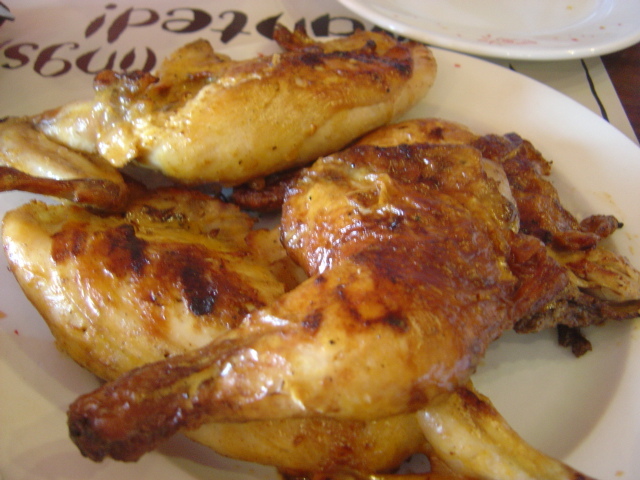 There are four pieces of grilled chicken and that must have belonged to a starving hen. The fries and coleslaw are alright both quantity and quality wise. The Portuguese buns, however, are a problem again. If you haven’t tasted them before, you would expect something along the lines of Focaccia bread. But when you actually dig into these buns, you feel….. nothing. It’s just ordinary bread baked in a unique shape. What’s more, its completely dry and there’s no butter or dip or anything to go with the buns. Unless of course you want to dip the buns in the peri peri sauces. We tried, but the experience wasn’t good. Taste-wise the whole deal is not bad but it’s not remarkable either. Either Nando’s should have kept the price low, the quantity high or if they didn’t want to change either of these two factors, they should have built up some hype around it like they did with Espetada Rustica. Maybe Nando’s people have got into their head that it’s their core product that sells and not the brand. If that is their line of thinking, then they are in for some rude awakening. 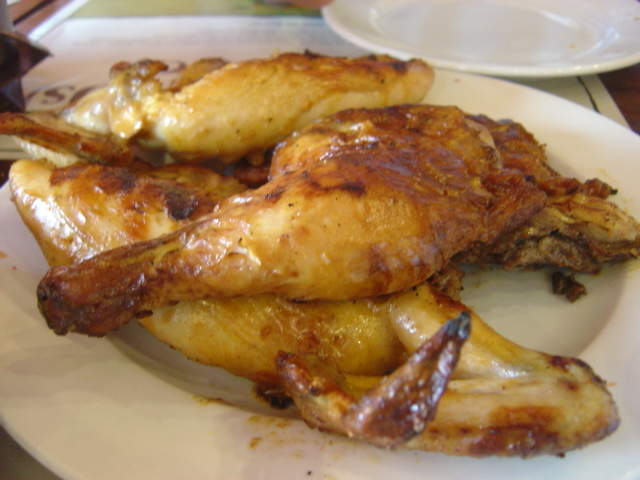 The truth of the matter is that their grilled chicken tastes pretty much what a grilled chicken tastes like at any upscale local restaurant. There’s no remarkable differentiation akin to KFC or even Pizza Hut’s USP. Nando’s brilliant branding and sales promotional tactics, specifically the tongue-in-cheek humor in their advertising is largely to account for the 6% share it holds in the Pakistani market. 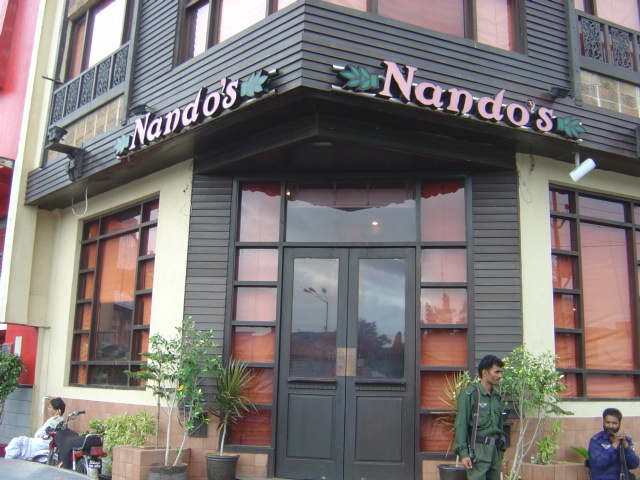 Strip away all the branding, and Nando’s wouldn’t be able to hold on to even this measly 6%. And that brilliance was sadly missing in this case. 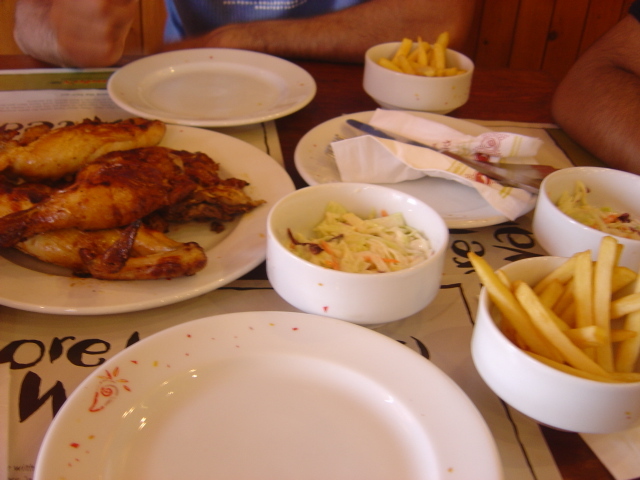 Although Nando’s core competency the world over is its numerous sauces, in this part of the world they haven’t been able to enthrall the local populace. So how can they go beyond the mundane and challenge the leaders? 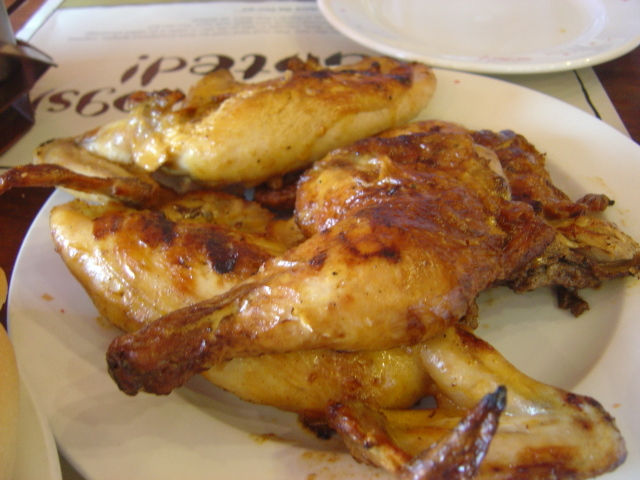 Follow what they did with Espetada Rustica. Weave a story around whatever the hell they are offering. Maybe a king used to love this mode of grilling chicken in the 10th century. How about Robin Hood’s culinary delight? Anything that catches the fancy of the target market. A unique style of presenting the deal would be extremely useful, after all packaging is an integral part of branding. 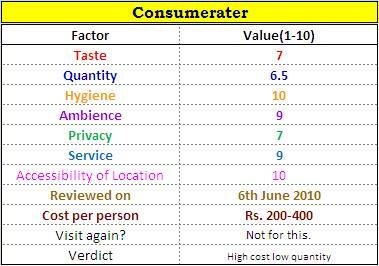 And then present a clear positioning of the meal and price it according to that positioning. If the deal is just to scintillate the olfactory buds of the consumer and not satiate his appetite, this ought to be communicated. Nando’s really has a tremendous opportunity of capturing a sizeable chunk of the Pakistani market especially since people already love having grilled chicken. What it needs to do is come up with attractive deals that offer the biggest bang for buck instead of merely teasing the consumer’s appetite.